How can I find the Learning Center on Apple.com? Click here to be directed to the Apple Learning Center. Where can I download the Pi version of Easy iWeb Publisher? Click here to download the custom software made for Washington Apple Pi. Where can I get a copy of Easy iWeb Publisher handout? Click here to download a PDF version of the handout we distributed. What is the link to see the set-up video for Easy iWeb Publisher? How do I delete files on wap.org if I want to free up space? 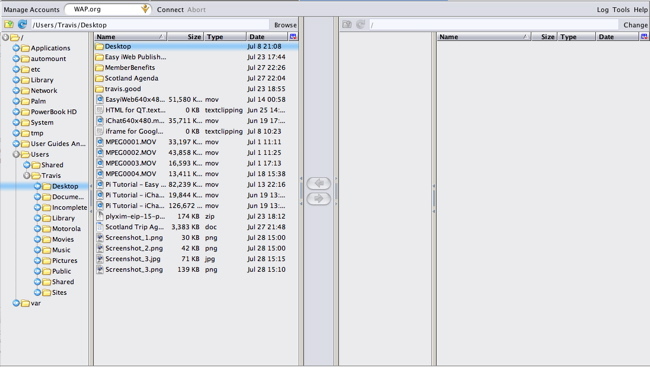 The general answer is using an FTP client of which there are many at VersionTracker.com. While there are lots of options available, Hal and I have a preference for using a Firefox extension called FireFTP. Once installed, this tool allows you to copy, move, and delete files from within the Firefox browser. Below I have a simple overview of how to get set-up using FireFTP. In the Tools menu, select Add-ons. At the bottom right of the Add-ons form, click Get Extensions. In the search field at the top of the web page, type "FireFTP" and click Search. Click on FireFTP and when the page appears, click on the Install Now button. Once it is installed, click the Restart Now button at the lower right. The good news is that you've installed FireFTP and can launch it in the Tools menu any time you want to use it. Go ahead and start FireFTP in the Tools menu now and let's configure it so that you can connect to wap.org. Above, the left half and the right half represent two different hard disks. In the example above, the left windows are my MacBook hard disk. The tall skinny window shows the folder structure of the disk. Note above how the folder Desktop is selected. In the window to its right is a list of folders and files which are the contents of the Desktop folder. After you complete the set-up process and connect to wap.org, the right half of the screen above will show the contents of your storage on wap.org. In the upper left you'll find the words Manage Accounts. Click the words and select New. 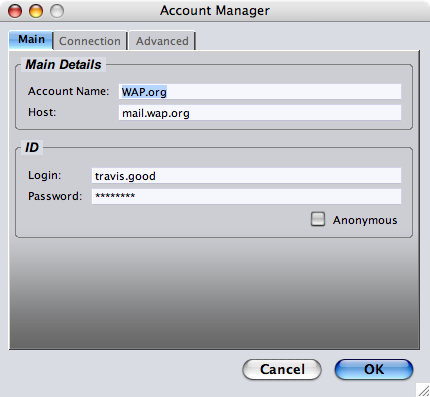 Fill in the Main and Advanced tabs as you see below, using YOUR wap.org account information. 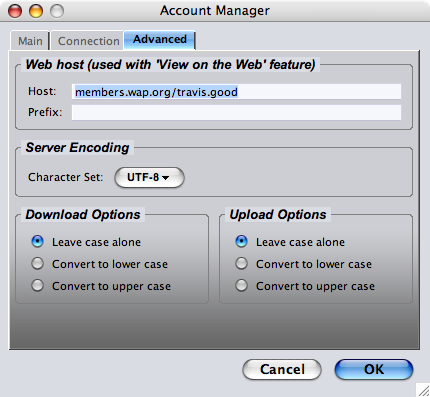 Where you see "travis.good" you should use YOUR account information. Password is again YOUR password. Click the OK button to save your configuration. Now for the reward you've been waiting for! Click the Connect button and, if all goes well then FireFTP will connect to your area on wap.org and the right half of your browser which was previously blank will fill with the contents of your 25 meg of storage. Below you can see how my right half now shows folders where before it was blank. On the far right are all the folders which I published using Easy iWeb Publisher. 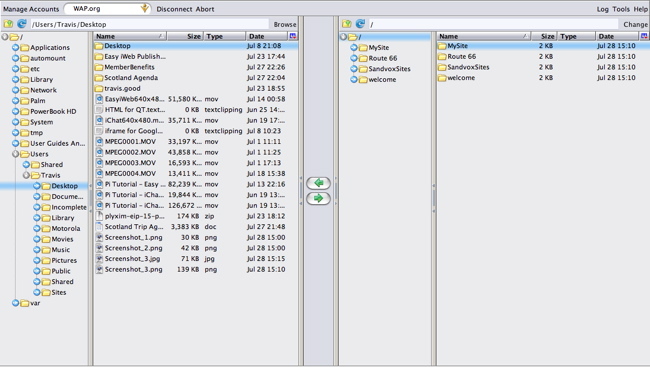 In each folder are all the files of a web site. By holding the Ctrl button and clicking on any folder (or file) I get a menu which among other things allows me to delete. There is a lot you can do now that you have an FTP client running. For instance, I can also move files and folders back and forth between my computer and wap.org by selecting them and clicking the green arrow buttons in the middle. However, that's another lesson for another day. Start with using FireFTP to manage your wap.org sites, in particular, deleting unwanted folders.